McDonald's to ditch plastic straws - Wisdom is the retention of innocence through adversity. 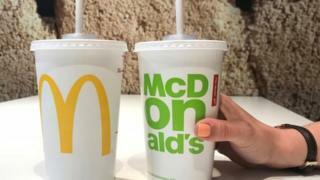 McDonald's will replace plastic straws with paper ones in all its UK and Ireland restaurants, starting from September. It is the latest company to opt out of some single-use plastic products which can take hundreds of years to decompose if not recycled. The restaurant chain uses 1.8 million straws a day in the UK. This decision follows a successful trial in selected restaurants earlier this year. The move to paper straws will be completed next year. Environment Secretary Michael Gove called it a "significant contribution" to helping the environment, adding that it was "a fine example to other large businesses". The ban does not yet extend to the rest of the chain's global empire, but trials will begin in selected restaurants in the US, France and Norway.